It’s time for the seasonal blog post! Winter in Utrecht has started early this year with lots of snow, therefore just one picture with snow will not do. The two pictures shown here are both connected with law and history. To make things more interesting I more or less turned around to take each picture at the Janskerkhof, the square around the St. John’s Church, in the inner city of Utrecht. The blazon on the facade of this seventeenth-century building might look familiar for visitors of this blog. On the page for Dutch legal history I show the blazon of the Province of Utrecht as a part of the United Dutch Provinces with the motto Concordia res parvae crescunt, “Small things grow through unity”. The former Hoofdwacht adjacent to the Janskerk was in the seventeenth century the main guard-house of the city. It now houses the office of the department for postgraduate legal education. During the summer the Utrecht Summer School, too, uses this building as one of its offices. The choir of the Janskerk housed until 1820 the university library. The bronze statue of Anne Frank was created in 1959 by sculptor Pieter d’Hont (1917-1997). Every Saturday a lovely flower market is held at the Janskerkhof square. No doubt this has inspired the members of a female student association to establish the tradition of laying flowers at the pedestal of the statue whenever one has successfully passed examinations. One can access the Utrecht Law Library at several entrances. It is remarkable the entrance at the Janskerkhof is not also its main address! The elaborately decorated entrance was built when after 1580 a former Franciscan convent was turned into the seat of the States of Utrecht. 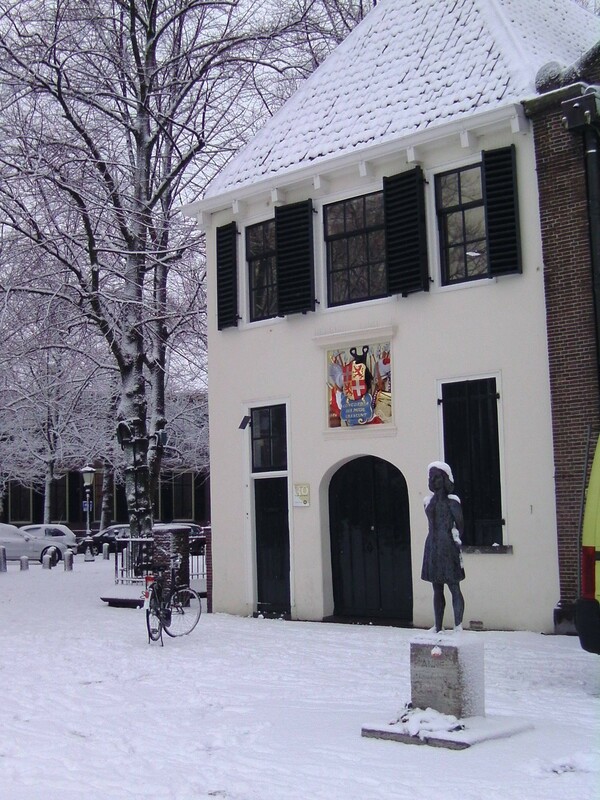 Between 1809 and 1811 a tribunal was housed in this building during the French occupation of The Netherlands. 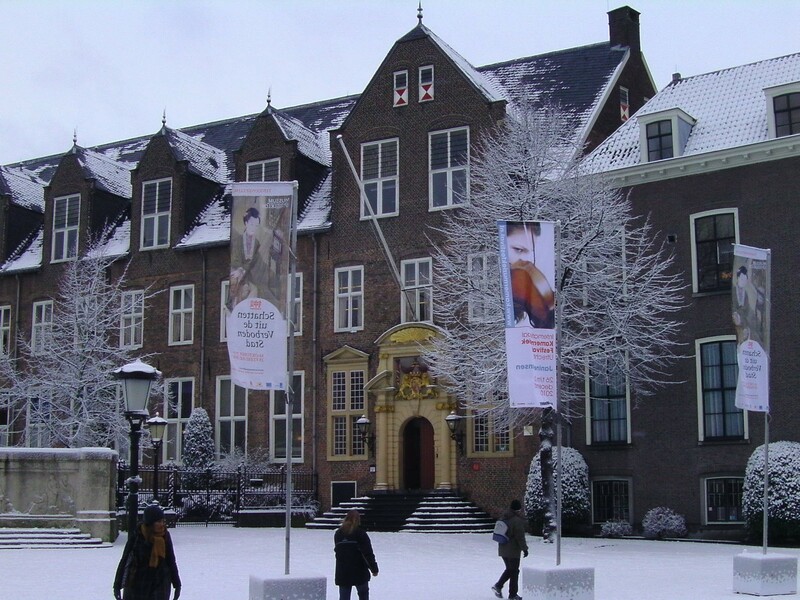 In the nineteenth century Utrecht University housed here medical laboratories and its anatomical museum, now housed at the University Museum. The zoological department remained here until 1975. In 1981 the building reopened after extensive restoration to house the Law Library. Since a few years large flags and photographs are put on display at the Janskerkhof to attract visitors to all kind of events. This time the outer flags point to the exhibition Treasures from the Forbidden City, featuring mechanical music instruments from Beijing at the National Museum for Mechanical Music Instruments. The flag in the middle alerts you to the yearly chamber music festival led by violinist Janine Jansen. The Janskerkhof was one of the places where composer and carillon player Jacob van Eyck (1590-1657) played on recorder his wonderful variations on all kind of songs, chants and psalms. Music is no newcomer here! This entry was posted in Buildings and tagged Legal history, Utrecht on December 22, 2010 by rechtsgeschiedenis.